Whatever you do, don’t call it tapas. 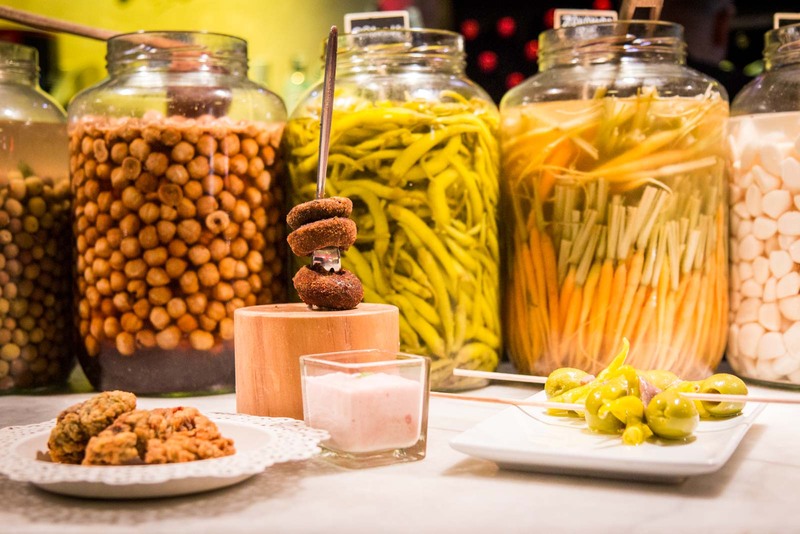 Spain is well known for its little snacks and most people are familiar with tapas. 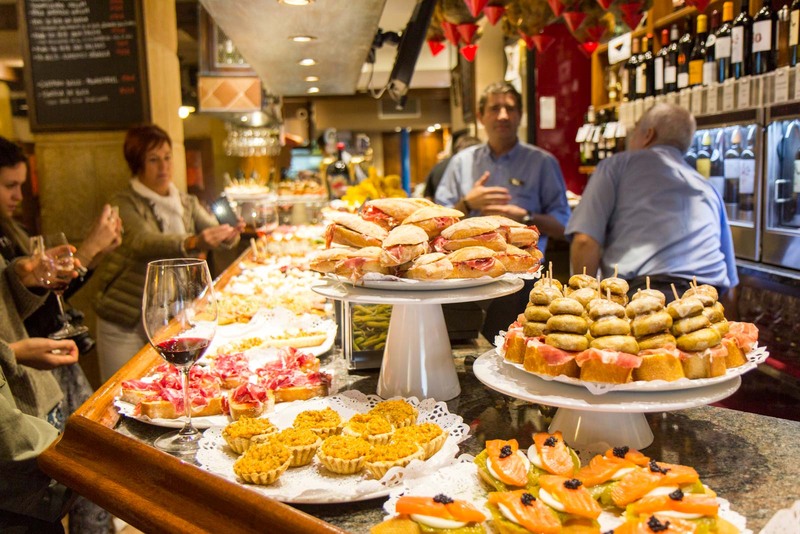 But in San Sebastian – here in the Basque region – they have their own unique way of snacking. 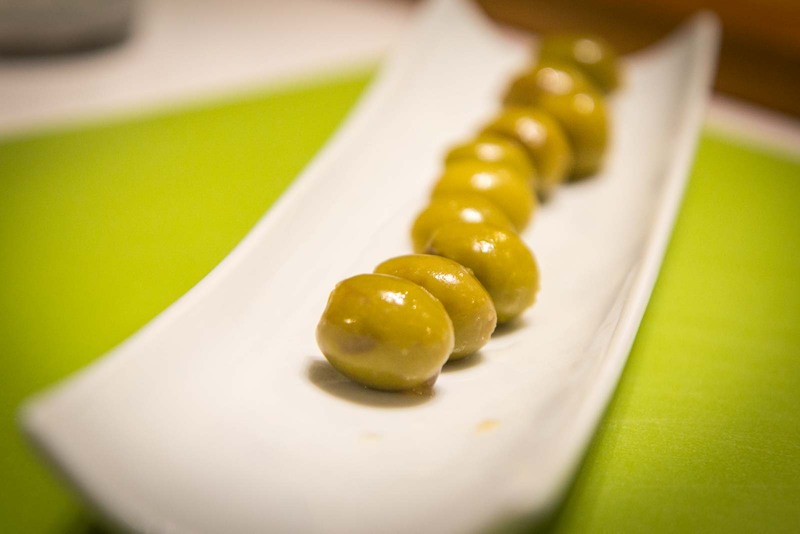 It’s called ‘pintxos’ (pronounced pin-choss) and you’ll find it everywhere. I’m not quite sure how to act at the first bar I walk into in San Sebastian. In front of the barman, on a shelf as long as the counter, is a whole row of plates stacked high with delicious little morsels. Most of the them are small slices of bread with different toppings – meats, seafood, vegetables, cheeses. I want to eat them all. But that’s not what you’re supposed to do. Despite my desires to shove every single one into my mouth at once like it’s an enormous buffet lunch, I follow the instructions of the locals I’m with and just try one or two. Oh, and I make sure to keep the little wooden sticks that had been protruding from them. 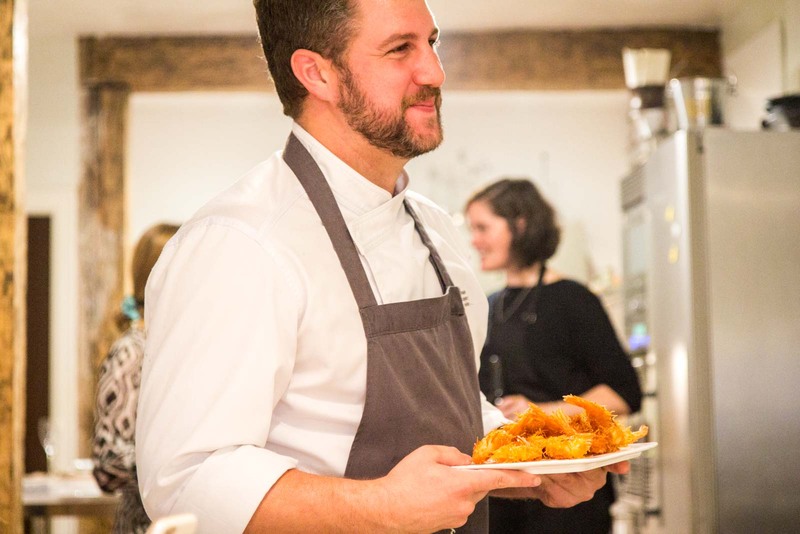 Local chef, Iñigo Zeberio, explains why. So you pay for your pintxos by the item and to keep track of how many you eat, you keep the wooden sticks. At the end, the person behind the bar will add up the sticks and charge you accordingly. The price will depend on the bar and the quality of the food but I find the average is about €2.50 for a single pintxos. There’s a bit of an honesty required in this system but it must work – the people of San Sebastian have been doing it for hundreds of years. 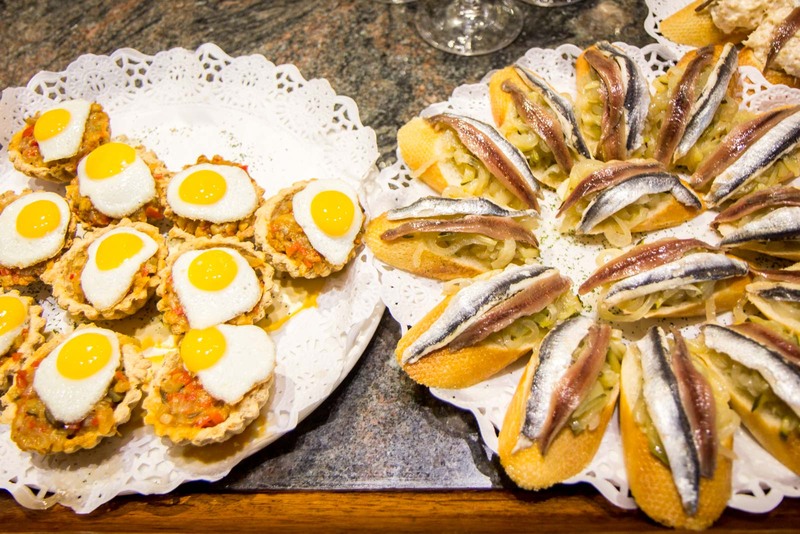 “The pintxos started in the 1950s when the rich people came from Madrid to San Sebastian and they wanted to take something to eat with their drinks,” Iñigo explains. It’s a neat story – but probably an oversimplification of what actually happened. Regardless, it does represent nicely what pintxos represents here in San Sebastian. It’s not about eating enough to be full or replacing a main meal with lots of snacks. 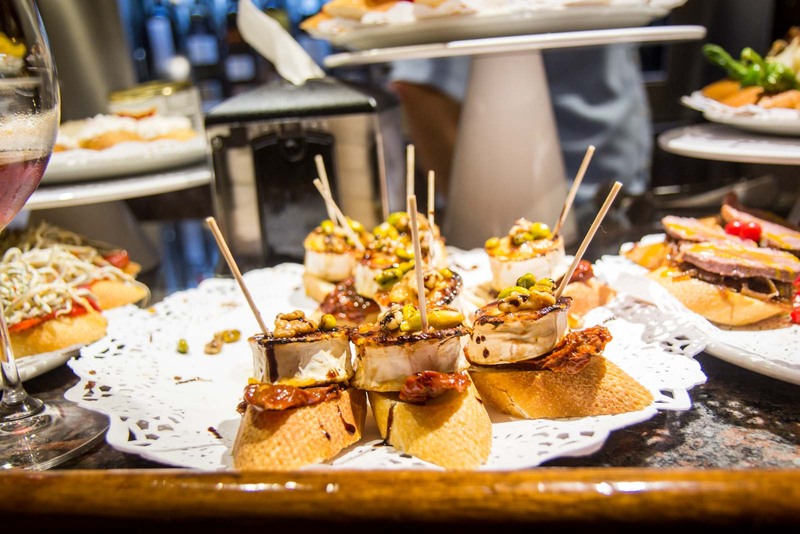 Like many bar or cafe cultures around the world, the pintxos are just an excuse to get together with friends or family. “Once a week, more or less, we go to take a pintxos with a friend,” Iñigo tells me. I see this San Sebastian culture firsthand for pretty much the whole time I am in the city. 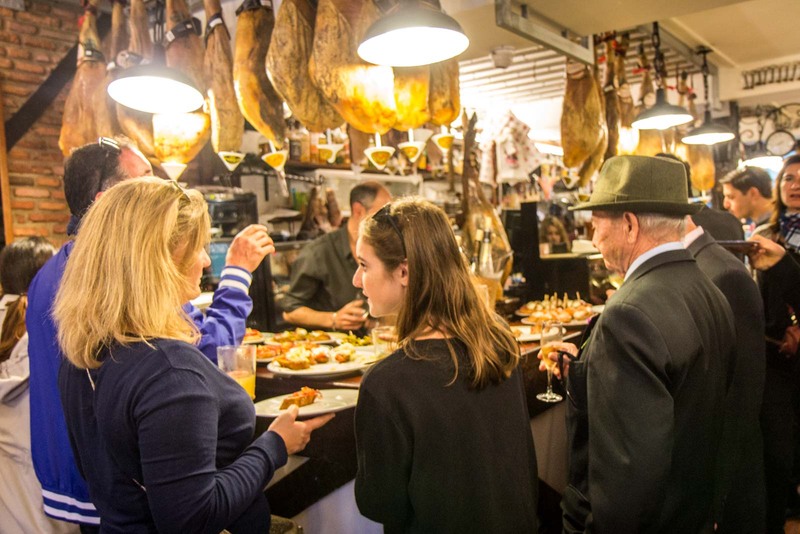 In the afternoons, the bars are crammed full of people standing around the counter or sitting down in the restaurants, having some snacks and (more often than not) drinking the local wine called txakoli. In the evenings it can get even busier. Even in the mornings – well before lunch – the bars of San Sebastian can be quite busy with what I assume is brunch. Brunch always seems to involve some kind of alcohol here. The pintxos culture fascinates me but ultimately the food should take centre stage because, well, because it’s delicious. San Sebastian has in recent years become famous for its culinary offerings and this is part of it. 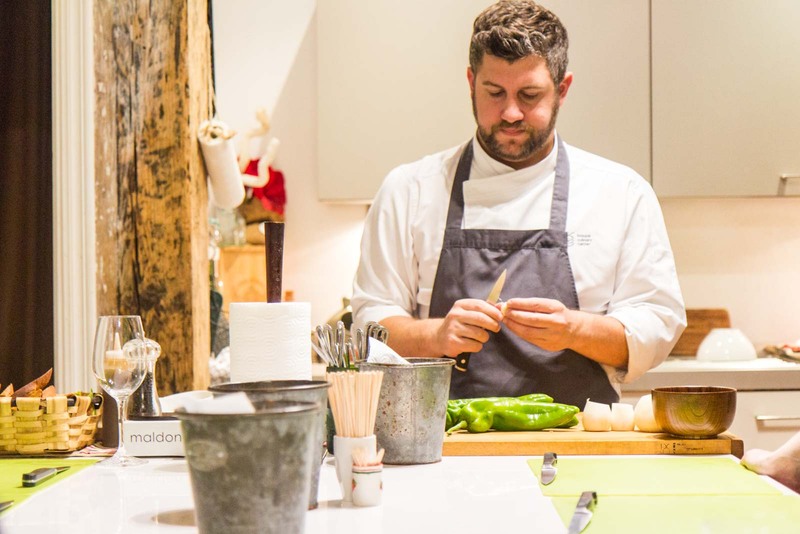 To understand the food even better, I head along to a cooking class run by Iñigo and organised by a company called Just in San Sebastian. Like most things involving food in San Sebastian, it stretches out over the afternoon and there’s plenty of wine. It seems like the perfect setting to learn some of the Basque cooking techniques. Unsurprisingly, pintxos feature heavily in the class. What does surprise me, though, is the amount of effort that goes into creating these little snacks. It is not a matter of just slapping some cheese or meat on top of a slice of bread. It takes time to craft the ingredients. The filling for the stuffed peppers, for example, involves peeling and chopping, then cooking, then mixing, then blending. Even when all of that is done, we still need to cook the peppers, peel them and then delicately fill them up. If I owned a bar, I think I would charge €2.50 for one of these too! It’s probably appropriate that there’s a group of us here around the kitchen table, chatting and drinking as we cook. I forget that this is a class quite early on and start to act like I’m just with a bunch of friends. That’s the way it is supposed to be. 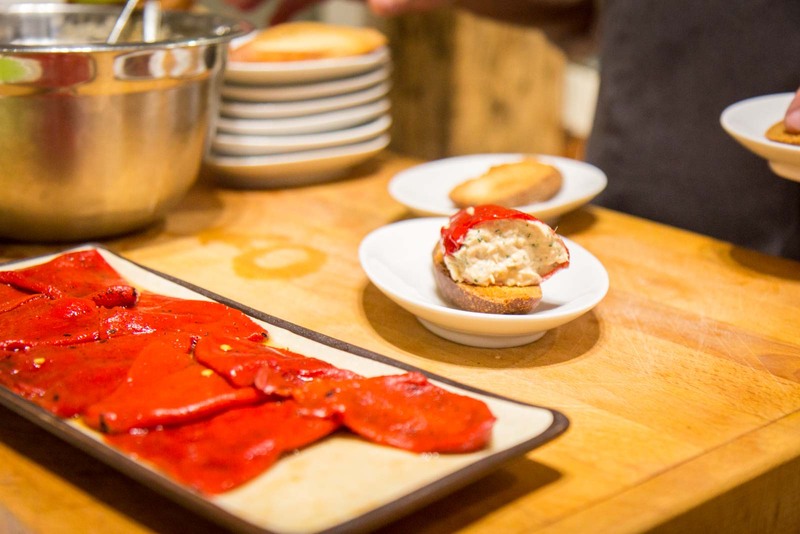 Just like eating the pintxos is a social experience, cooking here in San Sebastian often is as well. Food, drinks, friends. It is the way of life here. Pintxos sounds a bit like having sushi and paying per piece rather than having tapas, meze, or aperitivo! 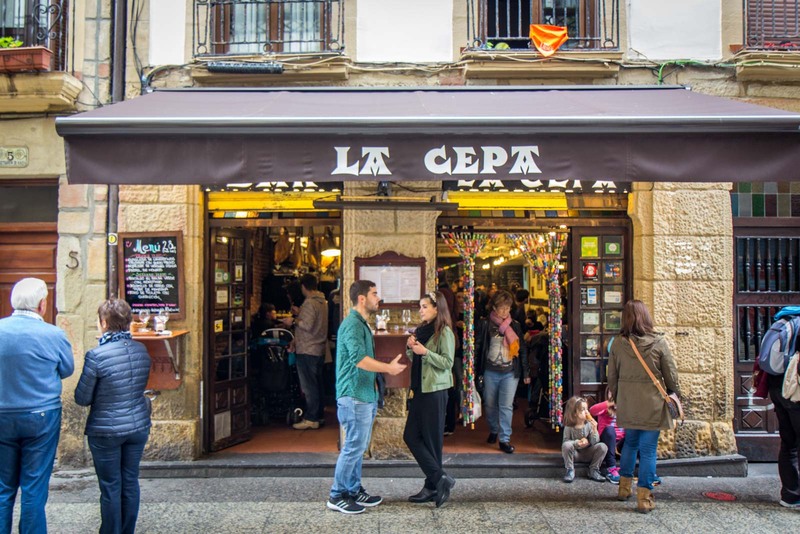 Thanks for this interesting article, I’ve always had my eye on visiting San Sebastian due to the surfing but now I know they have great food it makes it even more enticing. The stick collecting is such an interesting way of paying for food. 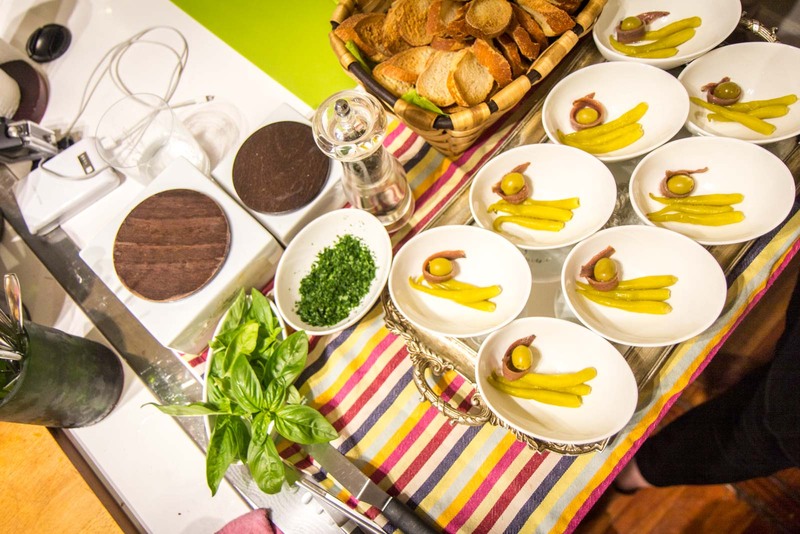 And I love the concept of pintxos, it allows you to try a whole variety of delicious food! Mr. Turtle, while slugging down a Gin Tonic I thought I would check the ‘correct’ ratio of gin to tonic and came across your site. What a find! My personal favourite is 30 mil Bombay Sapphire to 150 mil Schweppes Tonic, poured over three slices of Leb cucumber, NO ICE – yes, I’m yelling it. Lovin’ what I have read so far, and will direct my food/drink-obsessed daughter to this site. She particularly loves the ‘tapas’ at Bodega in Surry Hills, Sydney, however I will point her to your article from San Sebastian. You have at least one more fan. I love the pay-by-stick concept, but what happens when there is no stick in the food? Does that mean it’s a freebie? I also think it’s lovely that the idea relies on the honesty of the customer. Considering how long the tradition has been going for, it’s nice to know people are respecting the spirit of pintxos. Also, I’m now really hungry. Ha – I’m hungry now too, just thinking about it all again. I think there’s a bit of honesty involves when there’s no stick. That’s a good question – I hope I didn’t rip off any poor pintxos bar owner by doing something wrong! !